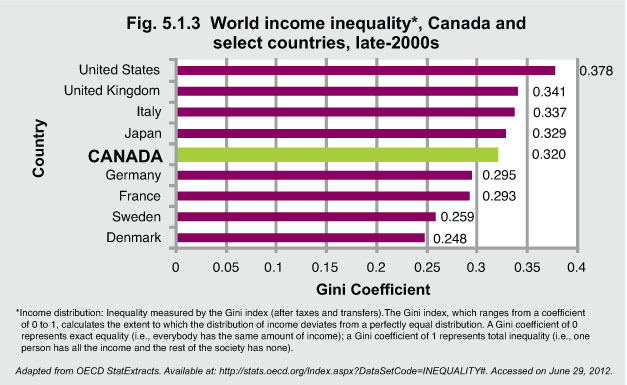 The Gini index is a measure of income inequality — the higher the coefficient, the greater the inequality. Among the selected OECD countries1, Canada has a lower Gini coefficient than the United States, the United Kingdom, Italy, and Japan but a higher coefficient than Germany, France, Sweden, and Denmark. 1OECD (Organisation for Economic Co-operation and Development) is an organization that acts as a meeting ground for 30 countries that believe strongly in the free market system. 2Kondo N, et al. (2009). Income Inequality, Mortality, and Self-Rated Health: Meta-analysis of Multilevel Studies. British Medical Journal. Available at: http://www.bmj.com/highwire/filestream/398332/field_highwire_article_pdf/0/bmj.b4471 – accessed on June 29, 2012.